The New York Auto Show was pretty boring, but one shining beacon of hope from the industry came from the German automakers, who decided to show up with a surprisingly diverse and exciting spectrum of car colors this year. We love to complain about luxury brands failing to offer anything beyond white, grey, black and blue, and we love to praise automakers when they get colors right. This year, Audi, Mercedes, Porsche and especially BMW showed up with some strikingly great paint work. We’ll start with our honorable mention, Porsche, which brought the very green 911 GT3 RS. Then there was Audi. When I went on the press launch for the latest S3 some time ago, Audi representatives claimed to have tried and failed to get colors other than grey and black for the event because the company hadn’t built any fun colors like yellow or red yet. That was sad. Audi has progressed a little further now, debuting the new RS5 Sportback in a striking shade called Sonoma Green. It’s a tantalizing mix of forrest and lime, and it catches the light wonderfully. They also managed to squeeze in a red Audi R8 in the corner, which looks great. Mercedes flexed with a giant green S-Class, and a Cardinal Red Metallic GLC and E-Class wagon, the latter of which will lock you in a trance until you are convinced you are Icarus, son of Daedalus who dared to fly too near the sun, and you come crashing back to reality only to realize a Mercedes spokesperson has been talking to you about dynamism for over five minutes. Volkswagen is a firm second place, if you’re counting, even being so bold as to proudly display all of their color options on a table. The actual cars were mostly good, too, with a Golf Alltrack in Great Falls Green Metallic as the crown jewel among decent green and orange Tiguans. I’m not sure they should have brought the Atlas, Atlas SportCross concept and Atlas Tanoak concept in basically the same shade of blood orange all parked next to each other. They all kind of... bled... into one another. 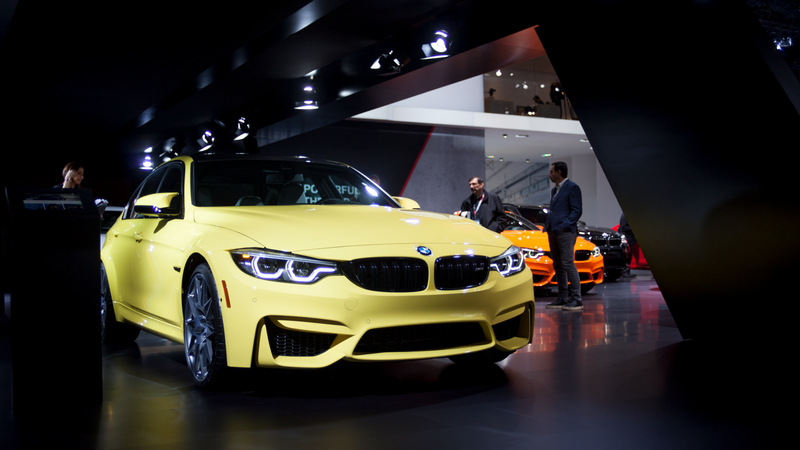 The best color of the show, by far, was at BMW. There was a blue Alpina B7, a flat green 6 Series, flat grey 7 Series, ruby red M5, sharp cheddar M4 Cabriolet and a mindblowing soft yellow M3. To literally top it all off, the upper level of the BMW stand had an M1 racecar in the ///M livery. The ultimate trump card. All in all, the Germans brought good cars in good paint. Buy these fun colors. Save yourself from the bland void of darkness and depression. Save us all.